Powerful women are not only the CEO’s of their organizations but also philanthropists and deal-makers who exercise their influence behind the scenes. Adrienne Arsht has led both from the front and from the back throughout her career, depending on what the situation called for. Discover how she became a great influencer! Adrienne Arsht is the daughter of the Honorable Roxana Cannon Arsht, the first female judge in the State of Delaware, and Samuel Arsht, a prominent Wilmington attorney. Upon graduation from Villanova Law School in 1966, Arsht was the 11th woman admitted to the Delaware bar – her mother having been the 5th. She began her Delaware law career with Morris, Nichols, Arsht & Tunnel. In 1969, she moved to New York City and joined the legal department of Trans World Airlines (TWA). She then became the first woman in the company’s property, cargo and government relations departments. She moved to Washington, DC in 1979 where she initially worked with a law firm, then started her own title company before moving to Miami in 1996 to run her family-owned bank, TotalBank. From 1996 to 2007, Adrienne served as Chairman of the Board of TotalBank. Under her leadership, the company grew from four locations to 14 with over $1.4 billion in assets. In November 2007, she sold the bank to Banco Popular Español and was named Chairman Emerita of TotalBank. But business has not been her only passion. As it’s often the case with powerful women (and men,) over the years she has taken a leading role promoting artistic, business and civic growth in the three cities she calls home: Washington, D.C., Miami and New York. She is Founding Chairman of the Adrienne Arsht Center Foundation in Miami, Florida where her $30 million contribution to Miami’s Performing Arts Center in 2008 secured its financial footing and ensured quality cultural programming. In her honor, the Center was renamed the Adrienne Arsht Center for the Performing Arts of Miami-Dade County. Her support of the transformation of Lincoln Center’s facilities and public spaces was recognized with the dedication of the Adrienne Arsht Stage in Alice Tully Hall. 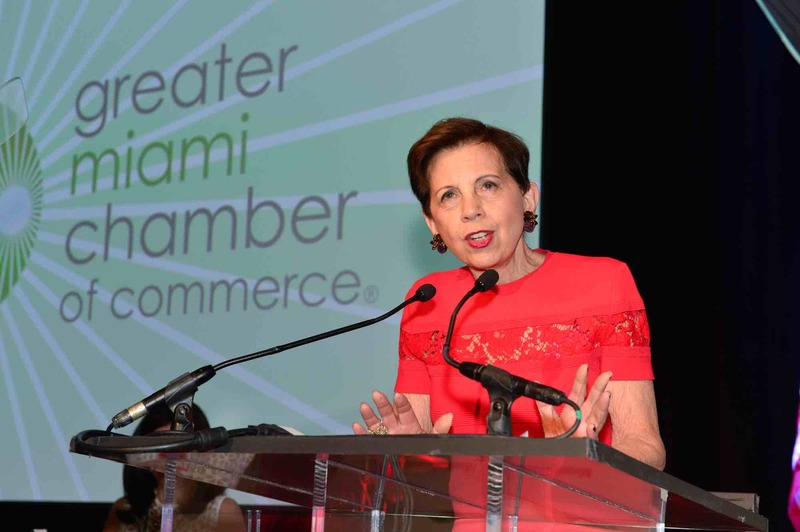 Adrienne has recently spearhead the creation of the Adrienne Arsht Center for Resilience at The Atlantic Council where she also endowed the Adrienne Arsht Latin America Center in 2013 to focus on the role of South America in the trans-Atlantic world. Over the years, Adrienne has generously donated funds and resources to numerous organizations. In 2008 she became the first, and still is, the only woman to join the Five Million Dollar Roundtable of United Way of Miami-Dade. 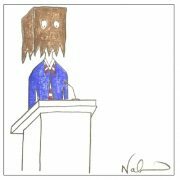 RSM: You’re a widely recognized patron of the arts. How did art enter your life and what makes it so important? Adrienne Arsht: My passion for art comes from my parents. There was always music in the house. My mother played the piano. I took piano and ballet lessons. Every Saturday we would listen on the radio to the Texaco live broadcast of the Metropolitan Opera. I was fortunate to go to theater in Wilmington, Delaware and New York City to experience Broadway. I cannot imagine a world without the arts. When giving to the arts, you are preserving the essence of civilization for now and for hundreds of years to come. It is thrilling to know that a gift to the arts will be shared by people in a future we can’t even imagine. Art is part of who we are and helps define us. It has been treasured for centuries and will continue indefinitely. RSM: Could you share the role philanthropy plays in your life? AA: Philanthropy is not just about giving money – it is about giving one’s time as well. It is the footprint that we leave. RSM: Many of your signature gifts have been to large performing arts complexes. Why have you chosen those as a focus of your philanthropy? AA: A performing arts complex offers an extraordinary value to a city. It brings the arts in their many forms to everyone of every generation and every interest. The Arsht Center has played a key role in the resurgence and transformation of the immediate area, the city of Miami and beyond. Another powerful woman you should read about: Lisa Lutoff-Perlo! 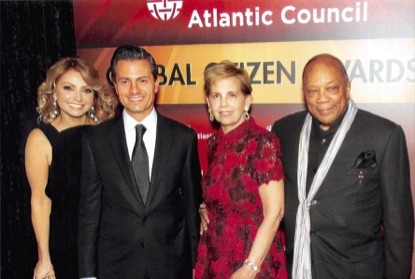 Adrienne Arsht, one of the most powerful women in America, meets with Mexican president Peña Nieto in the context of her work with the Atlantic Council. RSM: You are very involved with causes in Latin America. What’s your motivation? AA: In 1996, I moved to Miami to run TotalBank. After selling the bank in 2007, I moved back to Washington, DC. But, it became immediately clear to me that there was a need to find a way to integrate the interests of Latin America with Europe and the United States to shape the global future and create a broad community of common values. 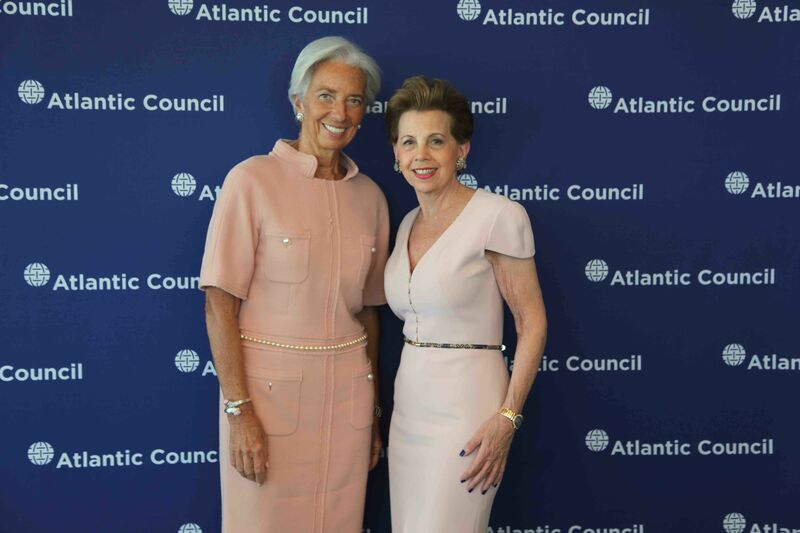 In 2013, this became a reality with the creation of the Adrienne Arsht Latin America Center at the Atlantic Council. This Center is dedicated to forging an effective Latin America-US-Europe partnership of common values and shared interests. I am thrilled to spearhead an initiative that will embrace Latin America as an integral part of the transatlantic world and give this vibrant region the recognition it deserves. RSM: Negotiating is an art in itself. What were some of the key takeaways from negotiating the sale of TotalBank, your family owned-bank to Banco Popular Español in 2007? AA: One Word – Patience! RSM: How would you describe your leadership style? Raised voices and four letter words do not get you anywhere! RSM: Would you share with us one of the worst mistakes you made in your career and what you learn from it? AA: I decided to reinvent Casual Friday and make it more a Dressed Up Friday based on our wonderful holiday party where everyone looked simply glamorous and festive. The idea was good but I had not taken into consideration how the employees would be able to do this. Coming to work on subways and buses or dropping children off at school would not work in party clothes. So lesson learned: When wanting to implement a new idea make sure you get full buy in on the project before putting it out there! RSM: How do you want to be remembered? AA: I want to be remembered as a good friend and someone who had courage. Our time on earth is a gift. We pay rent for the time on earth and that rent is how we give back. Making the world a better place is the basis for all I do. I learned these values from both my parents. My Mother was compared to Joan of Arc – someone willing to die for a cause. I hope that I would do the same. 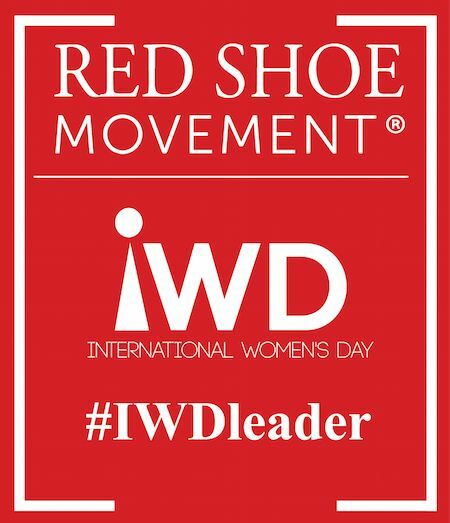 https://redshoemovement.com/wp-content/uploads/2017/05/Adrienne-Arsht-leadership-style.jpeg 500 500 Red Shoe Movement https://redshoemovement.com/wp-content/uploads/2017/02/RSM-logo-website.png Red Shoe Movement2017-05-09 16:16:032018-10-02 19:33:31Powerful women lead in many ways: Adrienne Arsht proves it! She’s as comfortable navigating Twitter as she is interacting with guests from all over the world on one of her luxury ships. 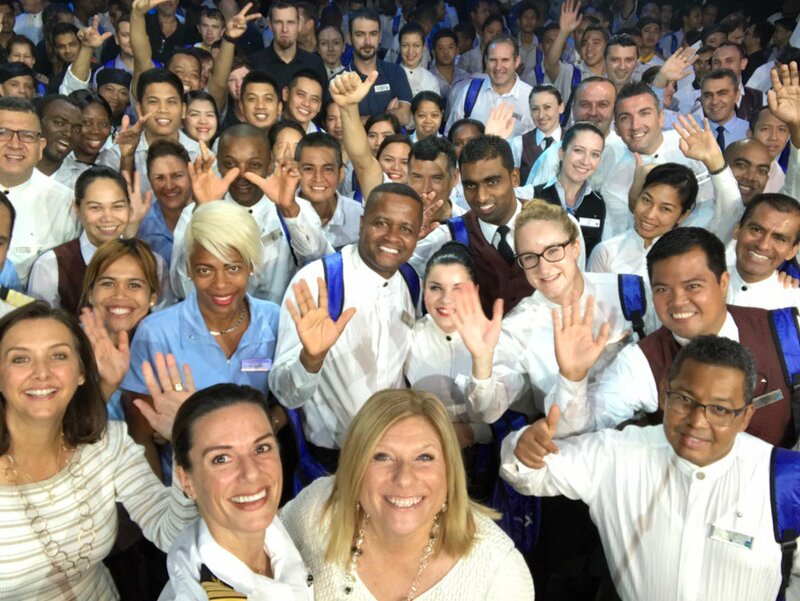 Lisa Lutoff-Perlo, President and CEO of Celebrity Cruises, is the kind of inclusive, forward-thinking leader needed for the 21st century. We met on Twitter, Lisa Lutoff-Perlo and I. A fact that speaks volumes about today’s most effective leaders and their need to stay connected. Very naturally, our conversation about female leadership moved off line. 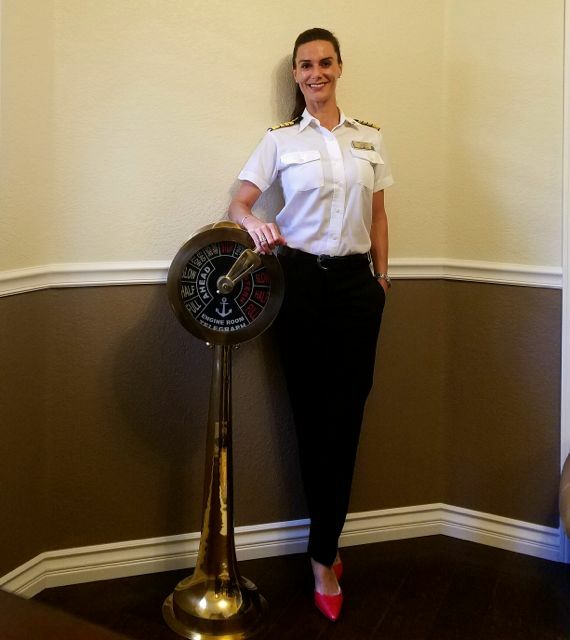 Lisa had hired the first American woman Captain of a mega ship, Kate McCue, and we wanted to interview her, which we did. 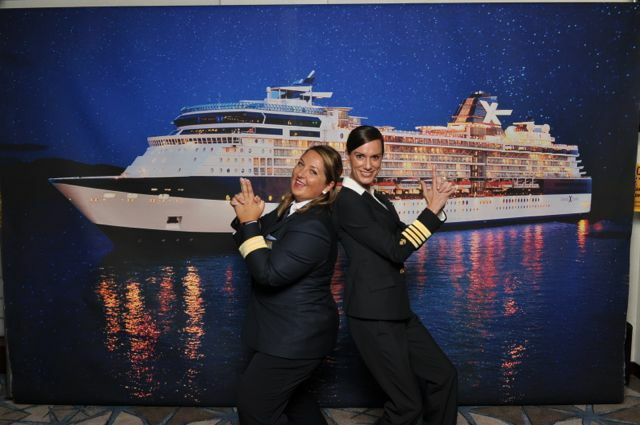 But hiring Captain Kate was just one more way in which Lisa Lutoff-Perlo showed her role as an innovator and disruptor in the industry. At work, she’s always challenging assumptions, looking for more creative ways to open up the world through travel, to help bridge the many divides we are facing as people. That powerful drive to break the rules of her field was behind the development and launch of next-generation cruise ships that Lisa led twice. Most recently, the just revealed Edge-Class, a completely new type of cruise ship experience. Outside of work Lisa is constantly inspiring girls and women to dream differently. 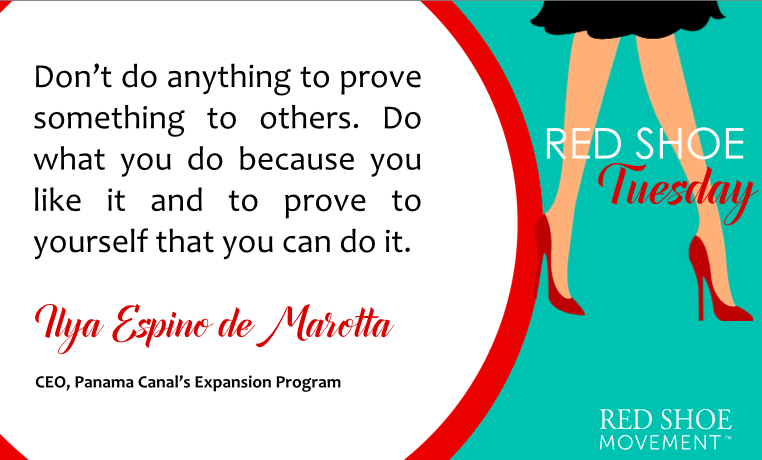 As she shares her own story of self-limiting dreams, you’ll see why she’s adamant about passing on the learnings. 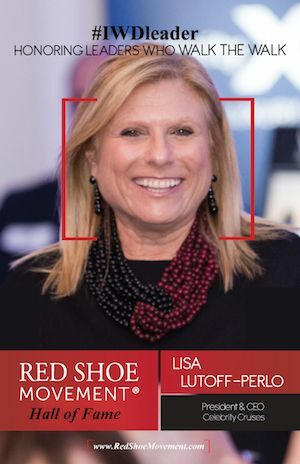 Lisa Lutoff-Perlo, a true role model for the Red Shoe Movement Hall of Fame. 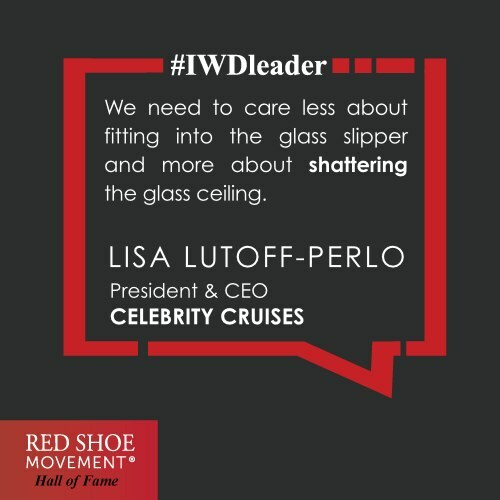 Lisa Lutoff-Perlo, President & CEO, Celebrity Cruises, is an innovative leaders who is constantly reinventing her industry. I have the best job in the world, so it is hard for me to say there is a hardest part. I think, though, it is fair to say that there are things about any job that make it particularly difficult. For me, the hardest part of my job are the things I can’t control. Geo-political events that disrupt people’s desire to vacation in the amazing parts of the world we visit and issues that can arise when something mechanical happens to one of our ships. After all, they are vessels that, like our automobiles and despite the best maintenance in the world, can have something happen. Given that I am also the head of our entire corporate Global Marine Organization as well as President and CEO of Celebrity Cruises, I do have to ensure that our $45B of assets are running smoothly, safely and efficiently. I count myself very fortunate that I work with an amazing team of professionals who make the hardest parts of my job as easy as possible. What aspects of the job of a CEO did you not expect as you were advancing in your career? I didn’t expect to feel the overwhelming outpouring of support that I received when I was appointed to this position – both internally and externally. Nor did I expect to feel the immense gratitude each day for the people around me, who support the vision that we share for our guests, our crew and our brand. We live every day to open the world for those who want to join us as we explore each of the seven continents in modern luxury. We open the world so that people can experience different cultures and places. We also live every day to break down barriers that divide us. 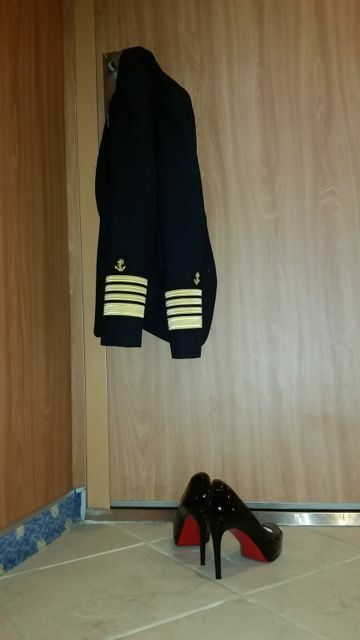 When I am on our ships and either meet our guests or watch our crew from over 60 countries taking care of each other and our guests I am filled with an unspeakable pride and grateful to know that I have the ability to create experiences that truly change people’s lives. I had not anticipated the magnitude of that. The other thing I did not expect is the opportunity and platform I have as a woman in this role to “pay it forward” and give back. That is another thing I wake up every day determined to do as I take that responsibility very seriously. What Was Lisa Lutoff-Perlo Major Career Mistake? Tell us about one major screw up in your career and what you learned from it? My one major screw up in my career was in limiting my aspirations. See, my professional goal was always to be the head of sales. It’s what I dreamed of and I campaigned for each day. Then my world and dreams came crashing down when the SVP of Sales & Marketing at the time decided to move me into a marketing role. I was absolutely devastated and he knew it. I felt crushed. That I would never achieve my dream of being head of sales. But he also knew what I didn’t know. That it would be one of the best career moves of my life. He saw more in me than I saw in myself. And that’s something very hard to accept at the time when it’s happening. That perhaps this other person sees more potential in you than you see in yourself or that they can see your career trajectory much farther out than you can imagine. The rest is history as I moved from one position to another and finally as the President & CEO of Celebrity. I learned that you have to go where your career takes you, be flexible, be open for change, and never ever limit what you think you can achieve. All of the experience and knowledge I gained along the way gave me the foundation I needed for my current role and has made me a better CEO. What is the best way to engage the executive men in an organization to support their female colleagues’ growth opportunities? I happen to work in an organization that values diversity of all kinds. Being the only woman on the Executive Committee gives me a unique opportunity to ensure that we are always thinking about and promoting diversity. I have always said that having a woman at the table enriches and changes the conversation in a way that is powerful. I am fortunate that my male colleagues agree. And I have a VP of Marine Operations who has increased the percentage of women on our nautical team from 5% 18 months ago to almost 20% today. I am fortunate to work with people who share a common vision. And you need to hire for that. 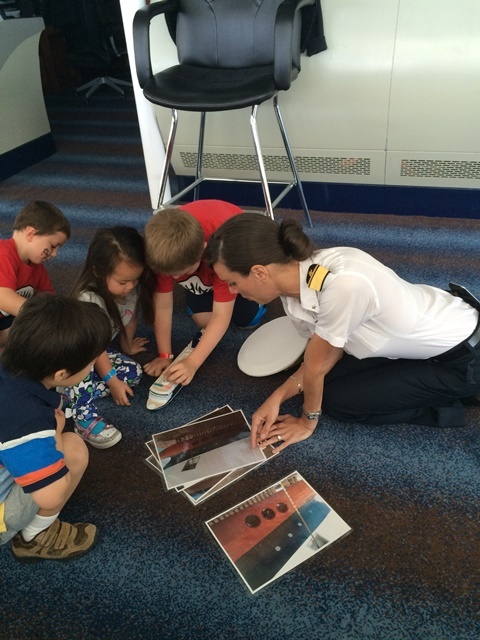 Launching a new ship class- Lisa Lutoff-Perlo does it again! 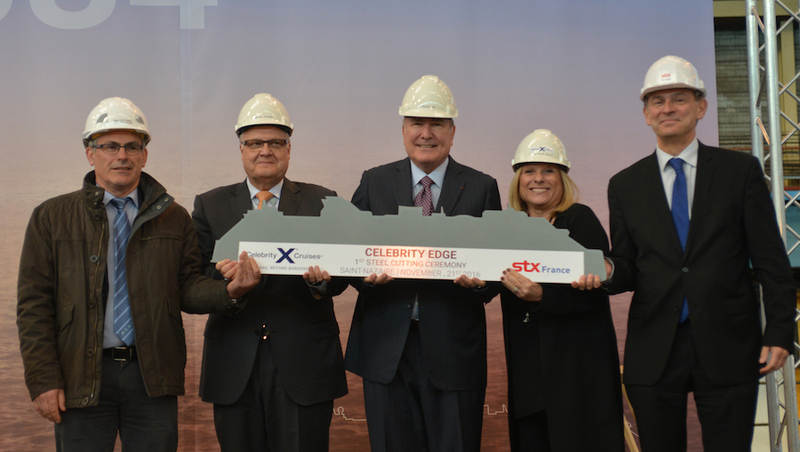 Lisa Lutoff-Perlo led the development of the Edge Class, a ship that completely changes de travel experience. Ten years ago you launched the Solstice Class. This March you launched the Edge Class. What does it take to bring a project like that to fruition? Launching ANYTHING new has its own unique challenges. For the Edge launch, I had a few key objectives. This new Class of ships had to transform Celebrity and the industry. And it had to transform the financial performance of my Brand. All of the feedback and booking activity has validated that mission was accomplished. From the design to the engineering and technology, we threw away the rulebook and took away every barrier for the sake of creating the most refined ship ever built. It took vision, determination, resilience and a village of outstanding people on my team and across our organization to make Edge happen. And a Chairman (my boss) who supported us every step of the way. We did it, I can’t wait for guests to be able to enjoy the fruits of our labor, and I can’t tell you how. Follow Lisa Lutoff-Perlo on Twitter. 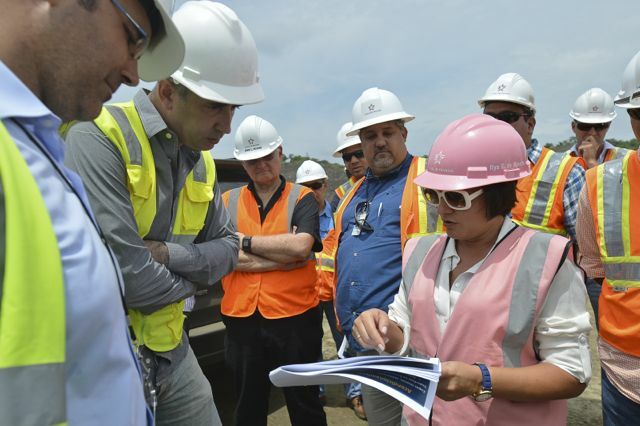 Her pink safety helmet and vest have become iconic in a a historically male occupation. 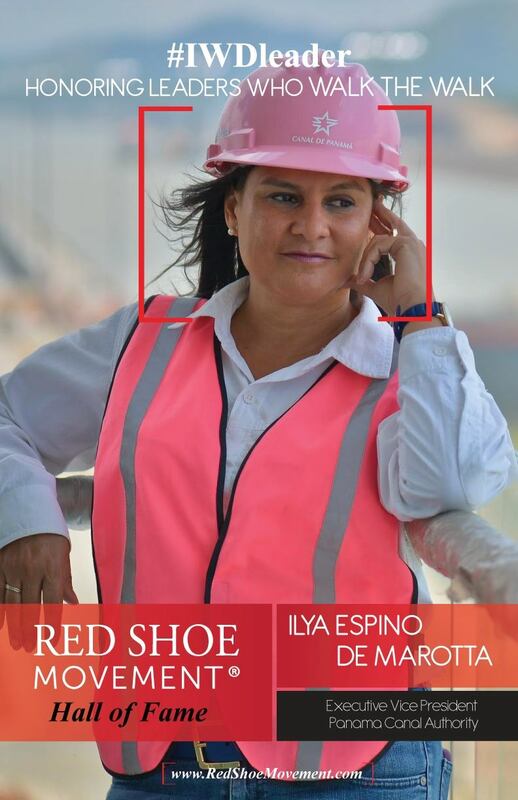 Ilya Espino de Marotta is the Panamanian engineer who led the execution of the Panama Canal Expansion Program. Get inspired! The new Panama Canal was inaugurated June 2016. An engineering feat that enables cargo ships with a capacity of more than double the current one, to pass between the Atlantic and the Pacific, which substantially reduces transportation costs of goods. Today we spoke with the leader of the project. An interview that will change your perspective on what you can or cannot achieve even when you enter a historically male occupation or field. 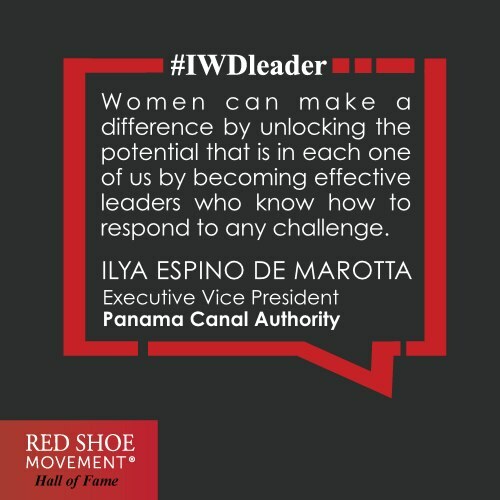 This is why Ilya Marotta is in the Red Shoe Movement Hall of Fame. What awoke in you an interest for engineering? How did you start your career? I had won a Fulbright scholarship to study marine biology in the U.S. The ocean is a passion of mine. I loved to scuba dive and I loved Jacques Cousteau. A year and a half after returning to Panama, when I saw the work opportunities in Marine Biology weren’t the best, I decided to change careers. I gave up the scholarship because it was for that specialty at a specific university. So, I started to look for schools in the U.S. that had careers that would have something to do with the ocean and ships.. 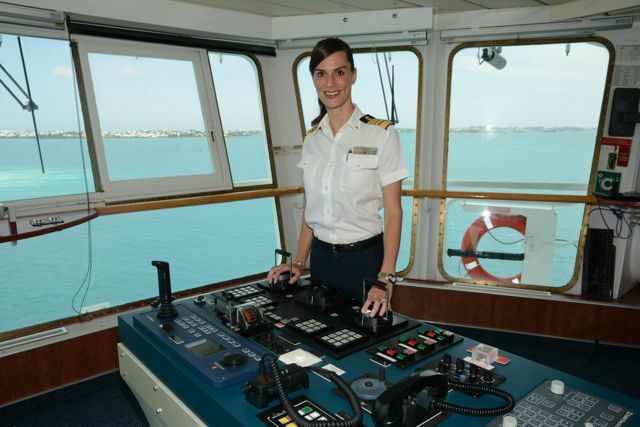 I was always very good at math and physics and I chose Marine Engineering because I was going to work with ships. My father told me he would only pay for four years of college and I wouldn’t have the three summers required for the sail practice. I chose a school that wouldn’t require me to sail in order to get my degree. So that’s how I applied and got accepted to Texas A&M University, which would give me the Marine Biology degree without the sailing requirement. So, I ended up studying Marine Engineering not because it was my passion but because it was close to the ocean. Once I graduated and came to Panama and started to work on the Repairing Dock of the Floating Equipment of the Panama Canal, however I fell in love with my career. It was very gratifying to design something in the office, go to the workshops where they built it, and then seeing the ship in operation with design I had made. We could say then that you came into this career path from the sideways and you found the pleasure in it along the way. And did you have the support of your parents, especially your father, to pursue what at that time (even more than today) was seen as a historically male occupation? Yes, 100%. Both parents supported my choice at all times. As you progressed in your career, what do you think was the role played by sponsors? Do you think they are an important factor to reach the highest levels in a male dominated profession? 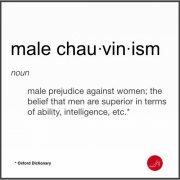 It’s what paves the way, especially in a profession where there are no women. If I had not had the support of my various bosses at different stages, I would not have been able to get to where I am. The way I won the support of these sponsors is with dedication, work, ethics and transparency. Once your boss sees your professional skills, it opens opportunities. All the people who have given me opportunities for promotion have been men. So sponsors are definitely needed, but their support is earned by the work one does. What were the most important obstacles you had to overcome in your career? I remember that when I was in the repair dam, a professional diver position for the Canal opened. I was a professional diver. I had done outside diving jobs, and I applied for the job but they did not fill it. Officially they told me that they were not going to fill the post at that time, but I knew they did not want to pick me because I was a woman. But you overcome those obstacles and learn from them. It has happened to me in other positions where I wasn’t chosen because of company politics. 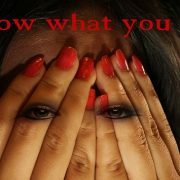 You have to make yourself known, because otherwise you do not move. In order to get to my current position I had to have the support of my direct boss, and my boss’ boss, because it was a position ratified by the board. One of the administrators at the time was very candid and told me that these positions are not reached by merit and professional ability. You also have to do a little lobbying. I was fortunate that my boss did the lobbying for me. The expansion of the Panama Canal must have been one of the biggest challenges an engineer can face. In a male-dominated profession what do you think was your advantage as a woman to carry it out successfully? You have to have a lot of emotional intelligence. You can’t take things personally. It is a big project, and you have to deal with many people, many contractors, and in this type of projects problems always come up. Things are not easy and simple. So when something happens, you have to look at it from both points of view: Your own and the contractor’s. I think I had the ability not to take things personally. To think that they are just situations and everyone is defending their own interests. Throughout this process of many years that we have been at work on this project, I had the ability to negotiate and be conciliatory. What do you think is the impact of resilience, a trait that is abundant in Latin American people and particularly in women? It is extremely important because you cannot let failures or errors discourage you. You have to always go forward, have the ability to overcome obstacles. What I always tell people is that they shouldn’t do something to prove anything to anyone. Do it because it is what you want and because you want to prove yourself that you can do it. I did not choose this career to show anyone that women can do it. I chose this career because it was something that caught my attention and I wanted to climb its ranks because I like it. 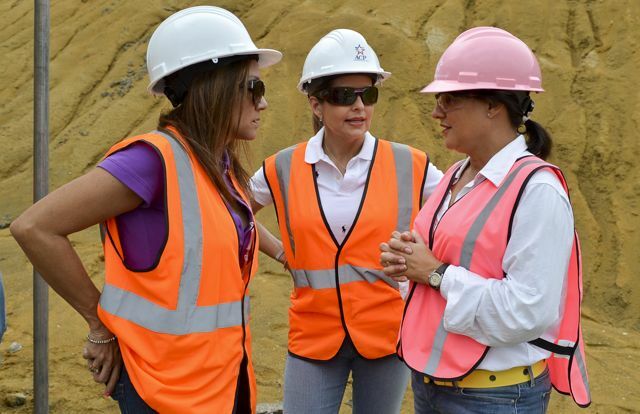 I have seen some photos in which you wear a pink helmet and vest, which highlights what is evident: that you are woman in a male occupation. What has been the effect? It has been fantastic! Although in the beginning I did it to prove to myself that I could reach this position. 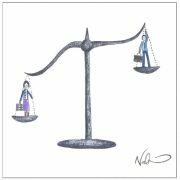 In Panama women in traditionally male professions have proliferated but reaching a high rank in a male dominated career is very hard. So when I was in NY, at one of my son’s medical checkups, I told my husband, “I feel like I should buy myself a pink helmet to show that a woman can get to this position.” I saw it in a catalog and I ordered it. Now it has become an icon and fills me with pride for what that helmet represents for many other women. I get messages from women who tell me that they have sent the photo to their 9-year-old daughters saying, “Look at how women can reach leadership positions.” It was not planned, but the result has been nice. It sets you high standards, because now people expect more from me. I have to show that it’s doable, no longer just for me, but for those who see me as hope for themselves, as an example. What advice would you give to a young woman today who is deciding on her choice of career or study? Definitely do something that you are passionate about. I had the blessing that although Marine Engineering was not my first love, over time I found in my profession something that fulfills me and I am passionate about. When you do something that you like, it brings out the best in you. Also, do not be afraid of challenges or changes. Whenever you get a chance, never think that you cannot do it. When I applied to different positions, maybe I did not know everything that they asked for, but I knew I could learn it. Finally, be a transparent person, treat everyone equally, be the same person in all environments where you work. Any particular advice for those women who are thinking of entering historically male dominated fields? Don’t take offense at everything in a world of men because they have their way of managing themselves and of being with each other. You cannot expect them to change for you. You have to adapt, as long as they respect you. For example, if they joke in a certain way, don’t get scandalized, unless of course, it’s something that refers to you. I learned how to deal with that, and so I earned men’s respect. It’s not about becoming a man either. I’m happy with them giving me their seat or opening the door for me. It’s about making it so you can coexist like men and women together pleasantly. And trying to be conciliatory, rather than antagonistic, that has also helped me a lot in my professional career. 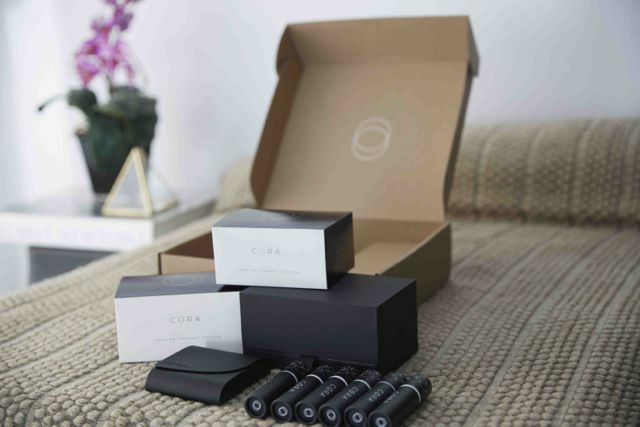 Cora has designed a chic and smart packaging to help manage women’s periods at work. Never again hide a tampon up your sleeve on your way to the bathroom! Their sleek black clutch could be a cosmetics case. And with a 100% organic product, there’s one less stress factor to worry about at work! Meet Molly Hayward, the female founder of Cora. As in, yes, there’s also a male founder. When I first heard about a company focused on how to manage women’s periods with a 100% organic product wrapped in the most stylish packaging I’ve ever seen, I was struck by the co-founders. A man and a woman who, as I’d learn later, didn’t know each other before they got into business together. Today we interview Molly to find out what inspired her to create a product to better manage women’s periods wherever they happen to be. We then talk about the stress connected to women’s periods at work and we ask her about what it took to get investors to buy into such a female-oriented idea. Molly is a young entrepreneur with a strong social conscience. She practices business with soul. In the last ten years, her travels through five continents became the springboard for her interest in how to manage women’s periods. The seed of a brilliant idea for Cora, a business that favors the circular economy. A business that helps professional women manage “that time of the month” fearlessly, openly, and with style. I’m sure you didn’t grow up thinking, “When I grow up I’ll found a company focused on how to manage women’s periods.” How did you stumble upon this as a need? The idea for Cora originated from my travels throughout the developing world, meeting girls who were missing days of school each month because they couldn’t access or afford safe and effective menstrual products. I had the idea to create a brand and a company that could offer women in my own society a better period experience, while also helping girls in need. For too long women’s periods have been a source of stress at work. Molly Hayward is set to change that! What’s different about the product itself? Is there any research regarding the stress at work women feel due to the stigma surrounding women’s periods? 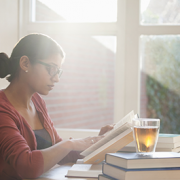 Research in this area has been primarily focused on the effects of stress in the workplace on women’s menstrual cycles, as opposed to our menstrual cycle’s contribution to stress at work. But there’s no denying that the workplace isn’t always the easiest place to easily manage our periods. From shoving tampons up our sleeves to walking to the bathroom from our desks to forgetting tampons altogether to the anxiety of wondering if we are leaking through our pants in the middle of a meeting, periods definitely bring stress into our working lives. That’s why Cora created high-performing organic tampons, as well as accessories for stylishly and discreetly storing and carrying them whether you’re at home, the office, or out on the town. How much are people attracted to the product because of the chic packaging that looks like cosmetics and jewelry cases? Do you think this contributes to a more seamless work-life integration? Cora’s products chic packaging makes it easy to manage women’s periods at work. Gone are the days when you had to hide your tampon on the way to the bathroom. I think the sophistication of Cora’s brand and products makes women feel confident at work—a place where we all want to feel more confident. We want women to feel like wherever they are, they can manage their periods without fear or shame. You met your business partner while seeking investors, right? How did it happen? Did you think that a man would be a good partner for a company selling a product for women’s periods? Yes! We were introduced by a mutual colleague. She knew that we were both working on similar concepts independently and suggested we meet. After our first conversation, we knew we would work together because our value around organic products, sophisticated design, and giving back to women and girls in need. Walk us through the process of getting funding for an idea. What did you need to show your investors in order to receive your first round of funding? And how hard was it to get funding for a product that dealt with women’s periods? 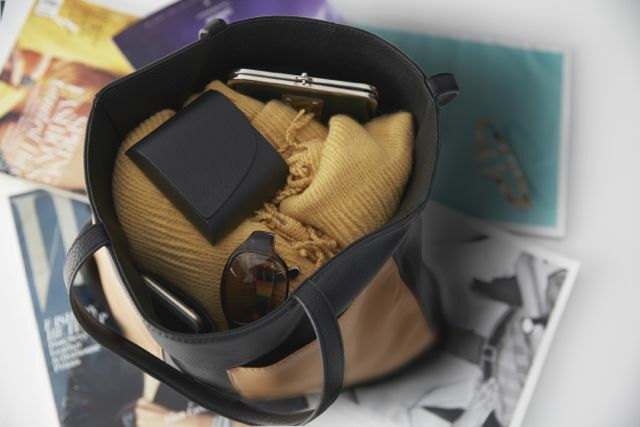 With unique packaging like this black clutch, Cora makes it easy to carry your supplies as any of your other accessories, reducing stress at work. Early on, we showed investors the positive data and reviews from our early Beta customers, and shared our future vision for the brand and everything we were doing to prepare and execute to make the vision a reality. We laid out our plan and showed where we’d already accomplished goals. Can you share any negotiation strategies that you used during the meetings with investors to get to a Yes? For us, it’s never been about negotiating. When seeking funding, we bring investors into the story and mission of Cora. We show them the negative experience that women currently have because other brands on the market don’t actually solve the pain points of having a period. When they consider the magnitude of the problem, it becomes a logical decision to join us.